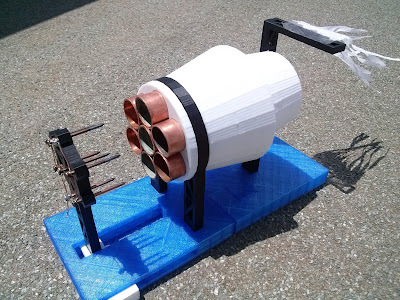 One of the cool projects I've worked on this summer was this Ionic Thruster. After seeing the original idea on Make Magazine by Alexander Reifsnyder, I was amazed to see it work so I decided to build my own version! To make use of the tools I had available I decided to build the entire structure using 3D printing. This way not only would be a more simple build but it would also be easily replicable. I already did a full article about this project on eLab Hackerspace's blog, but I'm going to summarize it here anyway. I made sure all parts fit on a 20x20mm printer bed so that most 3D printer would be able to print this model. The parts are available for download on Thingiverse. During the process you might need to replace the coins, because this works with oxidised coins. After a while they will loose that layer of oxidation and the process stops working. It’s also a good idea to add more lemon juice or vinegar and salt every once in a while. Pretty amazing! But how does it work? 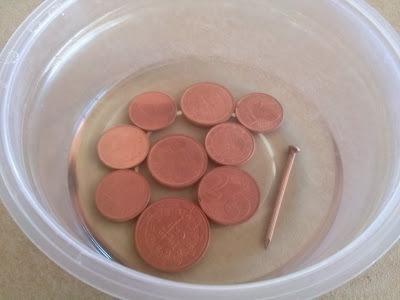 Well the nails will be one electrode and the copper pipes the other electrode. The high electric field around the nails will ionize the surrounding air, which means it will become electrically charged and will be attracted by the opposite electrode, the pipes. This will create almost invisible tiny beams of plasma. 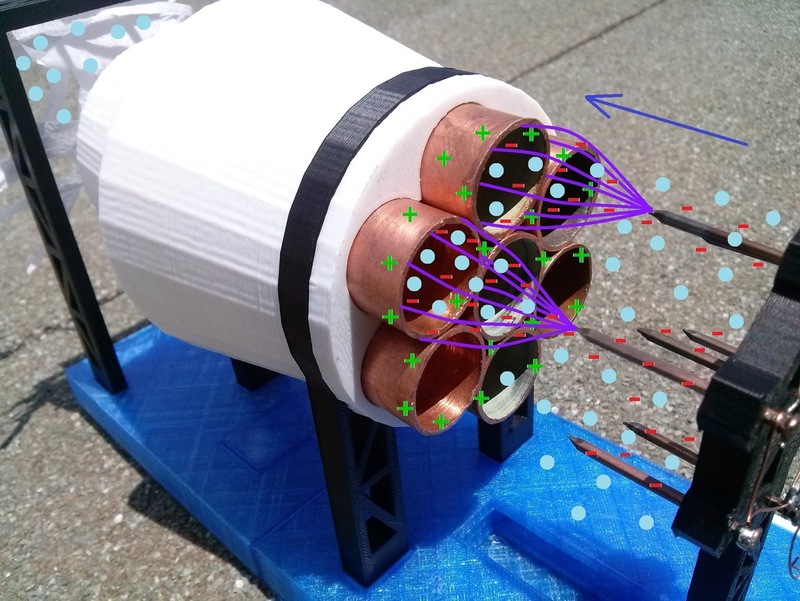 As the ions reach the tubes, the charges will be attracted to them but the neutral particles already gained momentum, creating a steady flow of air. But this project isn’t exactly an efficient engine though, is more of a scientific demonstration of the ion thruster working principle. That said, it won’t launch of the table but it will create a steady flow of air without using any moving parts, which is interesting. However in space there is no air to ionize, so this project as it is, wouldn’t work. But this technology is already being used in space probes, so what's the difference? Well in space it’s injected a noble gas like xenon, keeping the spacecrafts from using solid fuel, making this method more efficient and more appropriate for longer travels. But the working principle is still the same! I had the opportunity to take this project to Lisbon Maker Faire 2015 which got quite the attention of the visitors. It was also awarded there as the "Best in Class" of Science! I am making one and I have a 10,000 volt transformer. For some reason it is not producing any thrust. My setup is identical to yours, I just didnt 3D print and I used copper screws not nails. I think the nails may be the problem but do you have any recommendations? What type of transformer are you using? Are you sure it doesn't have open circuit protection? Have you tried putting the electrodes really close to see if it ever arcs? It definitely arcs if I start off with the leads close, but if I start off with the lead apart and bring them closer nothing happens. It does have open circuit protection, that's probably the problem. Yes, that's probably it. It will shut down if it doesnn't detect a load. And this project configuration is an open circuit. How would you configure this setup so it didn't have open circuit protection? Having the same problem on my end as well. There is no setup. Just use a different transformer without it. Copyright © 2014 by João Duarte. Awesome Inc. theme. Theme images by Ollustrator. Powered by Blogger.